Microsoft’s digital assistant Cortana can make your life easier and more efficient—if you know how to really take advantage of it. To help you get the most out of Cortana, I’ve put together some of my favorite tips for using it — including using Cortana to manage your Google Calendar, identify the music you’re listening to and track packages and flights. Note: This article assumes that you’re already familiar with the basics of Cortana. If you want help getting started, scroll to bottom of this post and you will fnd a link. How tall is [person]? It knows how tall most famous people are. So it knows, for example, that Barack Obama is six feet one inch tall (even though it doesn’t know he’s president of the United States). One way to extend the power of Cortana is to connect it to an account — for example, LinkedIn — so that it can look through information in that account when you ask it to do something and give you additional information about your request. To get this started, click in the Cortana search box and, when the Cortana panel appears, click the icon of the notebook in the left-hand navigation panel. Select Connected Accounts and you’ll see a list of accounts to which you can connect. You’ll probably also see services to which you can connect for which you don’t actually have an account — Cortana is showing you all of the services that can be linked, not necessarily those that you use. You can link a variety of accounts to Cortana, enabling it to search for additional data. To connect to an account, click it, then click the Connect button that appears. Enter the information you normally use to log into the account and Cortana will do the rest. 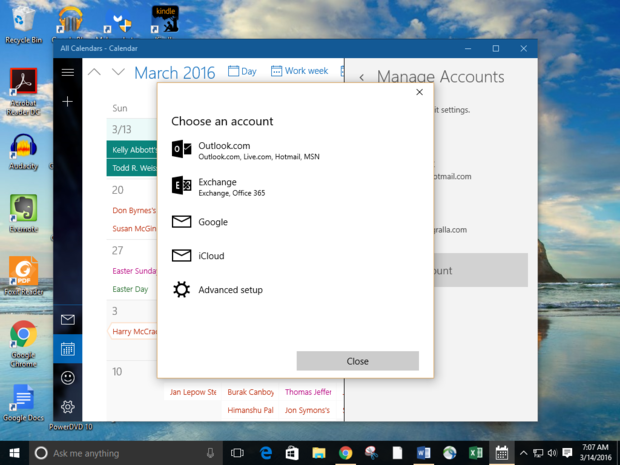 The benefits you’ll get from linking your accounts to Cortana vary according to the account. For example, if you link Cortana to LinkedIn, when it reminds you of a meeting, it will look to see if any of the people at the meeting are in LinkedIn. If they are, it will grab their information — including their LinkedIn profile photo, their job title and their company. You can then click on the person’s name to jump to the LinkedIn Profile. Note that the Office 365 integration is only available if you have a business Office 365 account, not a personal one. If you use Windows 10 apps, you’ll be pleased with some tricks Cortana has up its sleeve. You can use Cortana to work with those apps — for example, to find a show and play it on Netflix or Hulu. First, you need to find out whether a particular Windows 10 app on your machine integrates with Cortana. After downloading the app, click in the Cortana search bar and, when the Cortana panel appears, click the question mark in the left-hand navigation panel. (If you’re using the Anniversary Update, scroll to the “Tips & Tricks” section and click “See more tips.”) Scroll to the bottom of the screen that appears and you’ll see a list of the Windows 10 apps on your system that work with Cortana. At the moment, there aren’t that many. But several popular apps do integrate with Cortana, including Netflix, Hulu, FitBit and Uber. For example, if you want to play the TV series Master of None on Netflix, you can type “Netflix find Master of None.” (Actually, you can type “Netflix find master of none” — Cortana is case-insensitive. )If you want to use a voice command instead, you can say “Hey, Cortana, Netflix find Master of None.” Use the same syntax for Hulu — for example, “Hulu find Spiral” if you want to find and play the French police show. Several popular apps, such as Netflix and Hulu, integrate with Cortana, allowing you to use voice commands. Unfortunately, you’ll have to use the precise syntax required for each app — you can’t type or speak using real-life, natural language. And it’s different for each app. For Netflix and Hulu, for example, the syntax is [name of app] find [name of show]. You can’t say, “Play Master of None on Netflix” or even “Netflix play Master of None” and have it work. You can find the syntax for each app on the screen (mentioned earlier in this article) that lists the Windows 10 apps on your system that work with Cortana. Hopefully, more Windows 10 apps will integrate with Cortana over time as developers use Microsoft’s API. Next, click the Settings icon on the lower left of the Calendar screen — the icon is in the shape of a gear. When the Settings menu appears, select Account > Add account. From the “Choose an account” screen select Google. You’ll be asked to sign in with your Google account information. Follow the prompts to create the account. You can create an appointment in your Google Calendar using Cortana. When you ask Cortana to search the Web, it uses Microsoft’s Bing search engine. But if you prefer to use Google instead, you can — with a little bit of work. First, install Chrome. Next, you’ll need to set Chrome as your default browser. Open the Windows 10 Settings app and select System > Default apps. Click the browser icon and select Google Chrome from the list that appears. Note that this only happens when you do a Web search and not every time you do a search in Cortana. Cortana answers a lot of questions directly without sending you to a Web results page, as explained earlier in this article. For example, if you use Cortana to search for “Weather” you’ll see the results right in Cortana. Cortana can set three general types of reminders: based on location, time and contacts. Note that if the place isn’t one that Cortana readily recognizes, it will ask you for more information or have you type in the address yourself. Cortana allows you to create reminders based on location. You can set reminders in the same way for time and contacts. If you want to be reminded to fill your car with gas tomorrow morning, for example, you say or type “Remind me to get gas tomorrow morning.” A screen will pop up asking for more details, such as the exact time and whether it should be a recurring reminder. You can also tell Cortana to remind you to do something when you interact with someone in your contact book. So if you want to remind yourself to ask your friend Lydia about a dinner invitation, say “Remind me to ask Lydia about a dinner invitation.” A screen pops up asking for the contact’s name if Cortana didn’t recognize it. Then the next time you send or receive an email with that person, you’ll get the reminder. If you have a Windows phone, it will pop up when you talk by phone, also. Microsoft introduced a few new Cortana features in the Windows 10 Anniversary Update. So if you’ve got it, here are a few new tricks. The Windows 10 Anniversary Update adds an extremely useful feature for Cortana lovers: You can work with the digital assistant on the Lock screen, which means you won’t even have to log into Windows to use it. Scroll down to the Lock Screen section and move the slider to On. Look just below that for the setting, “Let Cortana access my calendar, email, messages, and Power BI data when my device is locked”. Switch that on as well. If you don’t, Cortana will be limited in what it can do for you from the lock screen — you’ll be able to listen to music and find out the weather from the lock screen, but you won’t be able to set reminders, send emails or add events to your calendar. This setting lets you use Cortana on the lock screen in the Windows 10 Anniversary Update. Once you’ve done that, to use Cortana from the Lock screen, you can just say “Hey Cortana” and use it from the Lock screen as you normally would, to set reminders, play music, check your calendar and more without logging into Windows. Overall, Cortana is a bit smarter in the Windows 10 Anniversary Update because it lets you use natural-language queries — in other words, make requests of it using plain English (or whatever your language is), rather than having to use specific words. For example, to send an email to a contact, you can now say “Send an email to Jane Doe.” Cortana will look through your contacts, find the person to whom you want to send the email, and then let you fill out a form onscreen to create and send the email without having to go into a mail app. If you’ve linked your Outlook account to another account, such as a Gmail account, it will look through that as well. And if it finds multiple matches for the person’s name, it will ask you which address you want to send the mail to. In the Windows 10 Anniversary Update, Cortana will automatically add events to your calendar based on emails you were sent — for example, it will add airline flight info to your calendar if you receive a flight confirmation via email. (This is something that Gmail already does.) Keep in mind, though, that it only does this with mail sent to your Outlook.com account. If the information goes to a different service, such as Gmail, it won’t work. There are a variety of other useful and/or fun things that Cortana can do for you. A couple of my favorites: You can track packages or flights by typing or saying the flight number or package tracking number. You can identify a piece of music (the same way Shazam mobile apps do) by asking “What is this song?” and holding your phone up to the audio source. Cortana will listen to the music using the phone’s microphone and (hopefully) tell you the name of the song. There are a variety of other useful services Cortana can perform, such as tracking flights. To find out other things that Cortana can do, just type or say “Help Me” and you’ll get a long list of other Cortana features. Click anything on the list — “Play music,” for example — and Cortana will do your bidding. Windows 10 Cheat Sheet Say “Hey Cortana”section of Computerworld’s.